A tote bag is literally the most versatile & useful bag you will ever own. There are innumerable uses for a good tote bag. You can take a large bag anywhere and fit into almost anything. Every woman should have at least one in their collection, at least one made of canvas. A tote bag often has sturdy handles & they come in a variety of sizes & designs. Some totes are designed to have several compartments, while others have just one, but whichever style you choose you are guaranteed to find plenty of use from it. 1. Fashion Accessory-Especially ones made of Canvas. Tote bags are known to be both fashionable as well as functional. There are many quality tote bags available that look gorgeous and are great for everyday handbags. You can buy stylish tote bags with designer labels. Excellent quality totes from bag shops, shoe shops, boutiques, as well as, accessory stores are available. 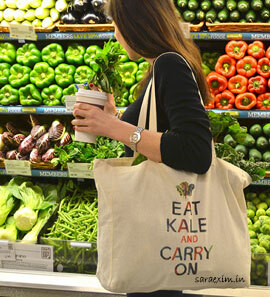 You can even buy canvas or material totes from department stores, supermarkets or market stalls. These bags can be enormous, as well as, roomy and are capable of holding loads of stuff. You can fit everything that you will require for a whole day at work and still have room left for more. Tote bags have a large list of uses. They can be used as environmental shopping bags, overnight bags, school or uni bags, gym bags, beach bags, work bags, knitting bags, laptop bags, etc. There are different versions of tote bags, suitable for all your needs. They are available in reusable bag material, such as jute, cotton or canvas and they come in different colours or patterns. These bags come in different sizes and styles but all the tote bags have basically the same design. Tote bags are known for its durability and long lastingness, if well taken care of they will last you for years to come. Tote bags, all the sizes or styles, can be re-used repeatedly. These bags are not designed for any specific purpose. You can use them for anything you want. A good quality tote bag is an excellent idea for gift, mainly due to their versatility, as well as, long lastingness. You can consider buying a nice one or a designer bag if it is within your budget. Another good gift idea is to use canvas tote bags as gift bags, they are much more sturdier than paper ones and can be re-used many times over.